In 1971 suddenly, and seemingly out of nowhere, an American singer-songwriter captivated many listeners with an epic but enigmatic song, “American Pie”, and the following year with “Vincent”. Much as I was tempted at the time to buy the “American Pie” album, I opted instead to buy Don’s debut album, “Tapestry”. Although the album, and its title track, shared the same name as Carole King’s better known “Tapestry”, the two songs are entirely different. I was 16 years old, and, having mastered a few basic guitar chords, I soon afterwards bought a songbook of Don’s songs and was able to progress from the usual beginner’s guitar material to something more satisfying! 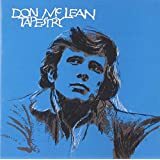 I was captivated, and despite owning several other albums by Don McLean, I still think this debut album is very impressive, with a number of powerful and moving songs. The lyrics are very thought-provoking, the tunes are generally melodic, and the arrangements vary from stripped-down voice and guitar to fuller sounds. Don was also blessed with a fine singing voice, and dexterity on acoustic guitar and five-string banjo. It’s worth observing that the gorgeous song “Killing Me Softly”, popularised by Roberta Flack back in the early ’70s was written about a Don McLean concert. Why not check out the lyrics or, better still, the song? The album cover replicates that of the original vinyl that I bought all those years ago, but with extended notes. opens the album with acoustic guitar introduction and also features strings backing Don’s clear voice. I suppose it partly reflects the naivete of the 1970s with its aspiration to exchange the rat race for a simpler, country life, even though it will mean parting from his lover (“Tell her the reasons why I can’t remain/Perhaps she’ll understand if you tell it to her plain…”) Don released a later version of this, but this earlier one was delivered with more conviction. is a clever, disturbing song. The music is in a minor key, and it’s doleful, less melodic sound suits its sombre mood perfectly. It’s about an arson attack on a local home, and implies racial hatred. is an ecological song, delivered by Don’s clear voice and acoustic guitar alone. I think the lyrics are strong, powerful, and poetic, with a golden dawn “held is suspension, like the yolk of the egg in albumen”, and a reference to mankind being “poisoned by venom with each breath we take/from the brown sulphur chimney and the black highway snake”. deals with the social injustice of a wealthy man being able to get himself off the hook because he can hire the best lawyer. As well as a reproach upon such people, it’s also a lament that many innocent people are found guilty because they can’t afford such lawyers. is another song about social injustice, this time the scandal of people loving below the breadline in “this thriving and prosperous nation”. The final chorus is extended with the image of a young, starving child, and builds up to a vehement climax: “He’s hungry and cold, his life has been sold, his young face looks old, it’s the face of America… dying!” As if the lyrics aren’t potent enough, Don almost shouts the word “face”. Strangely, these six songs marked the end of side one of the vinyl and also, in my view, comprise the six strongest tracks of the album, too. “Three Flights Up” is a lengthy treatment of individual, separate and lonely lives in an apartment block, and is poignant and thought provoking. “Bad Girl” is a wistful song about a good girl gone wild and ending up sad and alone, and there are some clever switches in tempo and mood. “Circus Song” is an introspective song about loneliness and disappointment. All these tracks may seem like heavy stuff, and they are. However, the mood of the album is alleviated by two rather delightful love songs. Given the songs on which I’ve commented so far, it may seem hard to imagine that the same writer composed “And I Love You So”, which became a hit for the crooner Perry Como. “No Reason For Your Dreams” is another winsome love song, pleading “There’s no need to find a reason for your dreams”, but rather just to enjoy the soulmate. I don’t listen to this album very often, but that’s more a reflection on the size of my music collection than on the standard of this album. Whenever I do listen to it, I find myself wondering why I haven’t listened to it more recently. If you are at all familiar with “American Pie”or “Vincent”, I’d urge you to give this album a try. Overall I feel that it’s at least as strong as the “American Pie” album. In fact, this is one of the strongest debut albums I have, and to my mind it still stands as a fine introduction to the music of Don McLean. I’d urge the same if you like songs with powerful, thought-provoking lyrics and/or a clear, fresh sounding male voice. Whilst the overall mood of the album isn’t overly cheerful, some of the tunes are upbeat and catchy, and the arrangements and instrumentation are varied. Although this is a non-profit-making blog, I am anxious to credit illustrations.